Webster's defines the word Parmesan as, "of or pertaining to the city of Parma in Italy." When used to describe a type of cheese, Parmesan is the generic English/American word for any hard, dry, sharp-flavored Italian-type cheese that is suitable for grating. 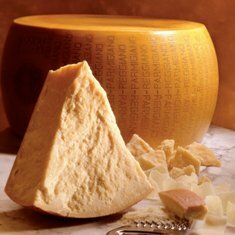 The authentic cheese from Parma that inspired the word parmesan is named Parmigiano- Reggiano. Real Parmigiano-Reggiano can only be made in a defined region of northern Italy that includes the counties of Parma and Reggio Emilia in Emilia-Romagna. A similar cheese named Grana Padano, also from northern Italy, is less well known in the US but outsells Parmigiano-Reggiano by 10 to 1 in Italy. Just like with Parmigiano-Reggiano, savoring an outstanding Grana Padano is also a heavenly experience. Pure pleasure is breaking off a shard and letting it turn creamy and crackly on the tongue. Cistercian monks first created Grana Padano in the 11th century. Parmigiano-Reggiano, originally a copy of "Grana", debuted about two hundred years later. Today, each cheese is made according to its ancient origin. Each cheese today is still identical to how they were centuries ago, having the same appearance, the same extraordinary fragrance, made in the same way, in the same places, with the same expert ritual techniques. Both Parmigiano-Reggiano and Grana Padano are DOP-controlled, meaning the Italian government dictates specific methods that must be employed when making and aging these cheeses. However, each cheese is manufactured to different quality levels of a strict grading system, and this is why the uninformed consumer can be disappointed. The Parmigiano-Reggiano Consortium defines six quality levels for its cheese. The Grana Padano Consortium has a similar grading scale of its own. Third-party inspectors examine the cheeses' external appearance and the texture and aroma of the interior by means of thumping a special hammer on the rind, or taking a sample with a cheese probe. Inspectors must also cut at least one wheel per lot to assess its structural and organoleptic (sight, smell and taste) features. There are significant differences even within a grade, mostly owing to aging. The optimal aging period for these cheeses is roughly two years, a bit more or less depending on factors such as altitude and the chemistry of the milk. Grana Padano can be sold after aging for only 8 months, while Parmigiano-Reggiano must be aged for at least 12. Aging must take place at a specific temperature and humidity with the cheese being turned regularly. As long as minimum requirements are satisfied, a manufacturer can call his or her cheese Parmigiano-Reggiano or Grana Padano. Because of that fact, many of the world's hard cheeses are called Parmesan. But only the top grade examples will truly excite the taste buds. These cheeses should be rich, fruity, and flaky, not salty, acidic or dry . 1. In the summer, the heat causes the butterfat in the milk to rise to the top surface of the wheel. In the winter, it remains deep inside. Consequently, winter cheeses tend to be more uniform and softer, ideal for serving as a table cheese, while summer cheeses are better for grating. 2. The name "Grana" comes from the ancient Latin word for grainy. These cheeses both contain crunchy white specks, which are actually the result of naturally occurring free amino acids that crystallize during aging. These crystals give Grana Padano and Parmigiano-Reggiano their distinctive, slightly crunchy texture. They also make these cheeses easier to digest and an excellent source of energy. 3. It takes 160 gallons of premium quality, part-skim, unpasteurized cow's milk to make one 80-pound wheel of cheese. As a result, each pound contains the concentrated nutrients of two gallons of milk. copper, potassium, sodium and cobalt. In fact, these cheeses contain 18 of the body's 21 required amino acids and contain almost 40% more nutrition than beef. 5. A mere two-ounces of Parmigiano-Reggiano or Grana Padano satisfies 60% of an adult's daily calcium requirements. Because they are made from part-skim milk, Parmigiano-Reggiano and Grana Padano are very low in fat and cholesterol compared to almost any other natural cheese. include these cheeses in their post-workout diet because eating them is a quick way to replenish lost nutrients. 7. Because of its healthy properties, many families in Italy sprinkle grated Parmigiano-Reggiano and Grana Padano on their baby's food. Because of its low moisture content, Parmesan cheese can be stored in plastic wrap. A hard cheese, such as Parmesan, will remain edible for three months if stored properly. If you find mold on hard cheese, it isn't necessary to toss it. You only need to cut off the moldy piece; the rest of the cheese is still perfectly good to eat.